They had to fess up to their own networking gear because of the pics in this thread. Maybe I'm being a bit thick but if the devices need to communicate with a server to make routing decisions for Openflow don't they need a traditional (albeit more lightweight) network infrastructure to handle the communications between switches and server? Teebor wrote: Maybe I'm being a bit thick but if the devices need to communicate with a server to make routing decisions for Openflow don't they need a traditional (albeit more lightweight) network infrastructure to handle the communications between switches and server? Based on the papers that I read (don't have time to set one up to play around...), yes in the sense that the traffic to and from the OpenFlow channel is not run through the secure channel (via TLS) that OpenFlow communicates in. However, just like the (now deprecated?) practice of using management vlan along with data vlan, there is no reason why you need a separate infrastructure for Openflow. The Openflow protocol itself has a Flowtable (that allows it to uses the TCAM) that keeps track of the flow which allow the router/switch to make both routing and switching decision. As for initial configuration, I suppose that'd depend on the vendor's implementation, but I can easily see an auto discovery feature via the Openflow port (actually this is explicitly stated in the most current specification as a future feature). Or more traditional setup when you'd statically configure the OpenFlow controller. "It can also be argued that DNA is nothing more than a program designed to preserve itself. Life has become more complex in the overwhelming sea of information. And life, when organized into species, relies upon genes to be its memory system." Regarding the ports, I had read -ages ago- that one of the things Google was trying to achieve with the home-grown boxes was cut costs such as certification (electromagnetic compatibility, etc) as well as simplify the electrical/signal quality requirements as they had very specific needs, cabling lengths, etc. And in particular, they were simplifying the SFP / SFP+ so that they did not have to have good signal processing meant for 100m or 10K runs when they only were trying to achieve 5 meter runs between the top of rack and servers. Did you try plugging an SFP at all in there?.. 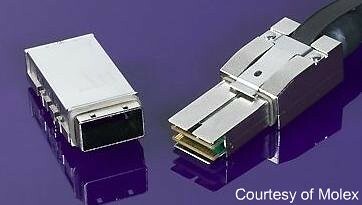 My bet would be a smaller (shorter) version of SFP+ active cables, with no signal conditioning at all and the shorter cages means a lot of the optic sits outside of the box and can be cooled passively (convection) without relying on the switche's fans or airflow to cool it. Things like disregard for EMC can be seen with the fact that the PCB protrudes out of the box. This would never pass approval for a commercial product and would require more complicated mountings, etc. You can see that the PCB is almost bare near the SFP ports, except the 4 ports on the back which look like "real" SFP cages meant for "fully blown" optics. Those seem to have a MAC chip next to each SFP cage since presumably those are their uplink ports and thus need longer runs and more traditional signal processing. I can tell you what that is right now, its a development switch that you can switch out the ports for either standard ethernet or fiber optic cable. with all those links on wired's front page this thread will be busy soon won't it? PS 14k views: Steve your hit count is going to go up this month, time to charge the advertisers more. in most operations solutions you have out of band network..
meaning those gigE interfaces are meant for getting an IP and booting an OS. booting an OS has the advantage that if something goes wrong you just reboot it and you don't need/want to spend time troubleshooting it.. upgrades are also easier this way.. Being an edge switch I think that they have loads of those (in each rack at least 1), so judging from number of ports you could deduct number of servers in a rack..
As for the interface type.. I would bet it's the cheapest SFP there is.. and copper would also be money-wise the preferred choice with a few being fiber for access/core switch connectivity..
what makes me wonder.. why are modules sticking so much out.. either it must be cooling choice or their racks have some space limitations when it comes to width.. Anyway.. these switches are not the interesting part, as the most magic happens in the core.. just imagine the beast that controls hundreds of plutos.. There was some info about the first trial versions of that, but it was a full-size server with 10G cards to demonstrate the concept.. They also used FPGAs for control plane functions then..
Last edited by ahabab on Mon Sep 10, 2012 1:24 pm, edited 1 time in total. 15K + hits on this one!! the coax ones I assume? price of one is around 1000$.. and it's 100G..
and I'm not sure if the FPGA on board could deal with forwarding 100Gb for 20 ports..
also I don't see the cage on the board..
garci66 has it. PCB sticking out is a giveaway. It looks like they may be doing 10G iPass to the servers, and then 4x 10G SFP for the uplinks. Oh the things I could say.. but I can't. PM me I promise wont tell anybodiez! Is it Arista gonna buy google? timhalo wrote: PM me I promise wont tell anybodiez! Woops didn't realize I just necro'd this thread - sorry about that. Lol - who can afford to buy Google? Companies can't even afford to buy their employees. Where do we sign the NDA to get the full scoop?